The blaze was suspected to have been triggered by an electric short circuit in the dialysis ward which spread to the ICU. 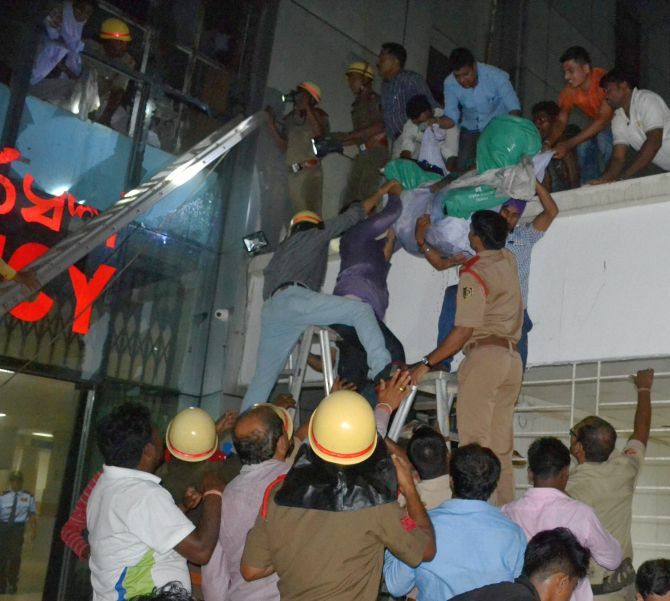 At least 22 patients were killed and over 20 others injured in a fire that broke out at the Sum Hospital in Bhubaneswar on Monday evening, in one of the worst such incidents involving a medical facility in Odisha. While 14 patients were received ‘brought dead’ at the Capital Hospital, eight were ‘brought dead’ to AMRI Hospital from the fire-struck private medical facility, officials said. “Most of the victims were in the first floor ICU of the ill-fated Sum Hospital,” a doctor at the Capital Hospital said. Voicing “serious” concern over the fire incident at the Sum Hospital, Chief Minister Naveen Patnaik described the mishap as “very tragic”. He directed the government hospitals to provide necessary treatment to patients shifted from Sum Hospital and requested all private hospitals to extend treatment to the patients from ill-fated medical facility. The blaze was suspected to have been triggered by an electric short circuit in the dialysis ward on the first floor of the private hospital which spread to the nearby Intensive Care Unit. The fire rapidly spread to other areas on the same floor of the four-storeyed hospital building. 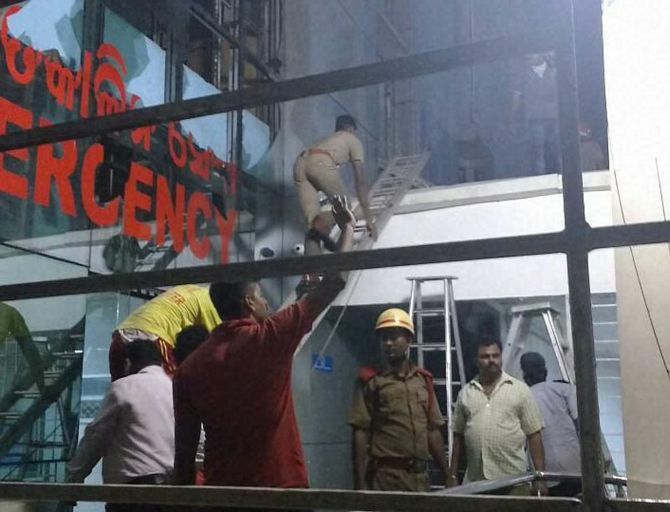 The commissionerate of police and fire brigade personnel along with volunteers and hospital staff launched a massive rescue operation as more than 500 indoor patients were trapped in the building, hospital officials said. At least seven fire tenders were pressed into service to control the blaze and over a dozen ambulances deployed to shift the critical patients to other hospitals. Many patients were rescued by breaking window panes, an eyewitness said. Meanwhile, the state government has ordered a high-level probe by the director, medical education and training, into the incident. State’s Health Minister Atanu S Nayak said stringent action will be taken if the hospital authorities were found guilty of negligence. 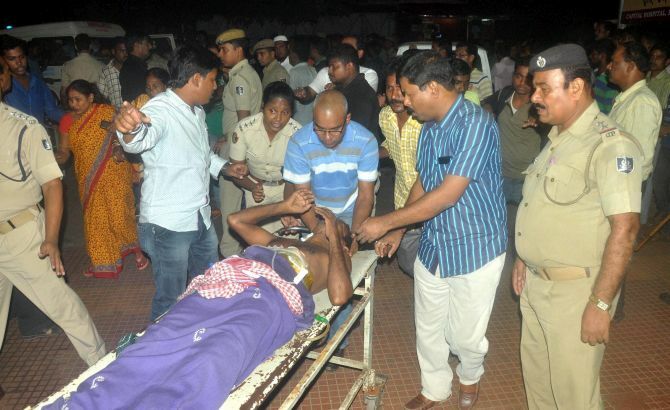 Director of the Capital Hospital B B Patnaik said most of the victims were admitted to the ICU of the Sum Hospital and receiving ventilatory support. Most of the deaths took place due to suffocation. Two of the critically injured patients have been admitted to the ICU of Capital Hospital, he said. Besides the Capital Hospital, Dr Patnaik said, the patients were shifted to nearby AMRI Hospital, Apollo Hospital, Kalinga Hospital, SCB Medical College and Hospital in Cuttack and some other hospitals in the state capital region. Union Health Minister J P Nadda also said the Centre is providing all necessary support to Odisha. Nadda said that he has already spoken to the AIIMS in Bhubaneswar and asked it to provide all necessary help to the patients. “Deeply saddened by the fire incident in Institute of Medical Sciences & SUM hospital Bhubaneswar. My condolences rest with the bereaved families. “I have spoken to director, AIIMS Bhubaneswar to provide all necessary support and help the patients in the best way possible,” Nadda tweeted after the incident. He said that the Union Health secretary C K Mishra has already spoken to Odisha Health department officials and was in “constant touch” with them. Prime Minister Narendra Modi on Monday night voiced “deep anguish” at the loss of lives in a massive blaze at a hospital in Bhubaneshwar, calling it “mind-numbing”. “Deeply anguished by the loss of lives in the hospital fire in Odisha. The tragedy is mind-numbing. My thoughts are with bereaved families,” Modi said on Twitter. “Spoke to Minister @JPNadda (health minister) and asked him to facilitate transfer of all those injured to AIIMS. Hope the injured recover quickly. “Also spoken to minister @dpradhanbjp and asked him to ensure all possible help to the injured and affected,” he said in a series of tweets. In 2011, a major blaze had engulfed AMRIHospital in Kolkata, killing 89 people, including 85 patient.